WordPress 3.9 saw a major overhaul of the TinyMCE text editor engine. And that affected every plugin that depended on it, especially advanced text editors. While TinyMCE Advanced developer Andrew Ozz chose to revamp his popular plugin, Josh Lobe has elected to go another route with the Ultimate TinyMCE plugin. It does not work with WordPress 3.9. Instead, there is a Pro, meaning paid version available that does. Read on for more of the changes, including what else you can get in the paid version that has nothing to do with text editing. Update: There is a free version of WP Edit in the WordPress repository. The more advanced features are found only in the Pro version. The information on the WP Edit site is a little sketchy. Here’s what I gathered about the new costs and what comes with it. A single site license of WP Edit is $35.00 that allows you to use it on your own site. A developer’s license at $279.00, which also includes the ability to sell sites with WP Edit Pro preinstalled. And that’s where it gets a little sketchy on details. I couldn’t find any info that listed the specifications of the sites. You have to join as a member first. And there were no details on how a developer sells or controls these other sites either. The toolbar icons are easily arranged and they even have settings to determine what tools are available based on the user row. In other words, Admins can have access to more tools than a person assigned as an Editor or Contributor can. There are also “dozens” of custom bottons. Only three of them are listed on the plugin’s site, which are YouTube, CodeMagic, which is an advanced code editor, and LoremIpsum, which generates placeholder text content. These custom buttons will be very handy for developers. Creating a Text widget is not that difficult without a special text editor plugin. You can create a page, save it as a draft, copy the code, and then paste it into a Text widget. But with WP Edit Pro you can create custom text widgets in a separate editor page, much like the Post and Page editor pages. They are displayed in their own lists too, just like Posts and Pages. And, you can assign them different widget tags and categories to help you manage them. Here’s another feature with sketchy details. On the Features page for the plugin, it states that there are eight option tabs for things like Google Webfonts, custom Widget Builder, custom user role button configuration and more. But then on the Member Plugins page, it states there are plugins to extend the functionality for things like custom styles, advanced configuration, and Google Webfonts. But then the only plugin listed is for Custom Styles. One of the other features touted is that the plugin is “network ready.” But what it is really referring to is the ability to auto detect a multi-site installation. And, it also refers to how the toolbars can be customized in the text of this feature too, which has more to do with user roles. 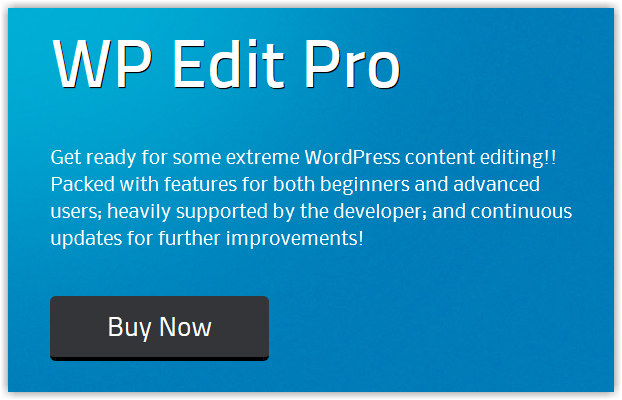 Most of the features of WP Edit Pro are geared specifically to developers and designers. Coupled with the ability to resell sites where they intend to do maintenance on a multi-site installation, this combination may be very valuable indeed. That’s especially true if they want to limit user access to certain tools that code goof up the theme styling or such. For the average user, though, the language on the site could use a lot of improvement to tell you exactly what you get. For a single site license, I honestly can’t tell from the info I was able to get from the plugin’s site if it would be worth paying for versus the free TinyMCE Advanced plugin, which has all of the advanced editing features that most users need. Did you use Ultimate TinyMCE prior to the WordPress 3.9 upgrade? If so, are you a developer and are you going to pay to keep using the features in WP Edit? This post is quite incorrect. Ultimate TinyMCE had both a free version and a pro version. With the release of WordPress 3.9 the name was changed to WP Edit, but it also has both a free version (http://wordpress.org/plugins/wp-edit/) and a pro version. Naturally, pricing and license terms cited in the article don’t apply to the free version. The name was changed (I think) to help make clear to users that the newly-named plugin doesn’t do everything that UTMCE did, so it would be misleading to call it a new version of the same thing. The reason for the reduced functionality is because of the drastic changes that were made to the underlying TinyMCE editor in WordPress 3.9. Some of the popular features of the free version of UTMCE, including font sizes and advanced link edit, are included in the free version of WP Edit. But others, like html magic and shortcode dropdown are available only in the Pro version because they required recoding from scratch in order to work with the new TinyMCE. It wasn’t an arbitrary decision to get users to pay for something they already had for free, which seems to be the thrust of this article. Bob, thank you so much for the clarification. I’ll be updating the post. If you’re a developer,too, you’ve got to have a lot of sympathy for the situation he found himself in. And I for one am impressed by the way he has handled it so far. Based on his track record, I’m inclined to believe his sincerity in his goal of continuing to improve the free version when reasonable to do so, while putting the big-ticket effort only into the Pro version to feed his family. Thank you, Bob. You are absolutely correct. The change was difficult for everyone involved. I’ve seen some other plugins (WP Super Edit) have fallen to the wayside. I will not be one of those people (either free or pro); and will continue to update each of the versions, as necessary. You are absolutely correct regarding the name change. I knew there was no realistic way for me to get WP Edit to where Ultimate Tinymce once stood. Had I tried to update Ultimate Tinymce.. and lost all that functionality from core.. everyone would have thought it was intentional; the plugin would have bombed. I’m not done yet ;) I have BIG plans for both plugins. We are only two weeks into the new updates and framework.. things will only get better from here! I think it’s a good plugin and certainly the WP update to 3.9 did make it hard for Josh. That said, you were overly polite about the language on Josh’s site. There are no details at all about what exactly you get in terms of function if you buy the Pro version. Which is why I haven’t bought it. Still, it’s new; no doubt more info will be provided soon (I hope). Most certainly. We have just completed our move to a dedicated server. With this transition, we hope to bring many new features and much more information to our potential customers. Additionally, we have a Knowledge Base where articles, tutorials, and examples will be added continuously. You can find the link to the Knowledge Base from our main site nav menu titled “Learn”. I do hope you stick with us… as we have big plans for the future. Josh, I completely appreciate that you have a lot on your plate with the WP 3.9 overhaul, plus any other moves and changes that you want to make for the plugin and related services. Thank you for the extra info, and we’ll be watching for more updates. Peter, agreed with all points. It’s rough on some plugin devs when the WP folks overhaul the core. On the flip side, I think very few devs do a good job with documentation for users. I’ve seen a lot of plugins that have widgets which will display on the site and not a single screenshot of how it will look when configured. MaAnna,Since you asked… I did use Ultimate TinyMCE (developer version) prior to the WP 3.9 upgrade. You ask if we are going to pay to keep using the features. After the transition to WP Edit Pro, Josh Lobe extended the paid UTMCE licenses to cover the new WP Edit Pro. So no, I didn\’t need to pay.If you are asking whether as a developer I would pay to upgrade from WP Edit to WP Edit Pro in order to get the advanced features, then yes, I would pay. I do understand there are some features yet unavailable, but they are coming on quickly so I\’ll just keep updating!As much as I like the toolbars for myself, it is more important for me to be able to provide the plugin to the client when I turn over their new website to them. :)Have you seen the \”format painter\” yet?! ï»¿P.S. I like your G+ comment section – I\’ll have to look up that plugin! Sorry about the poor formatting above. Firefox crashed and recovered while I was nearly finished writing. Looks like the comment area does not like contractions… ? Kathy, really appreciate you letting us know why you are willing to pay for it and how important it is for you to provide for clients. And glad to know that even more options are coming for it. FYI, I did not like the G+ plugins and hard coded the comments section into my site. For one, the plugin placed it above my author resource box. How it acts on your sites may be different, but watch for that. I believe Google has quite a bit of info about working with their API.